I love coconut. Coconut anything, really. Whether savory or sweet, coconut adds a deliciously sweet, nutty, exotic flavor to just about anything. My family has always been big on the coconut macaroons. While no one in our family made particularly great ones, we often bought them on our expeditions to different little bakeries here and there. The best coconut macaroons I have ever had, hands down, are the preposterously enormous ones sold at the little bakery at Harris Ranch in Coalinga, California (on the drive up from LA). They are huge, but light, almost cakey, and packed with a punch of coconut flavor. 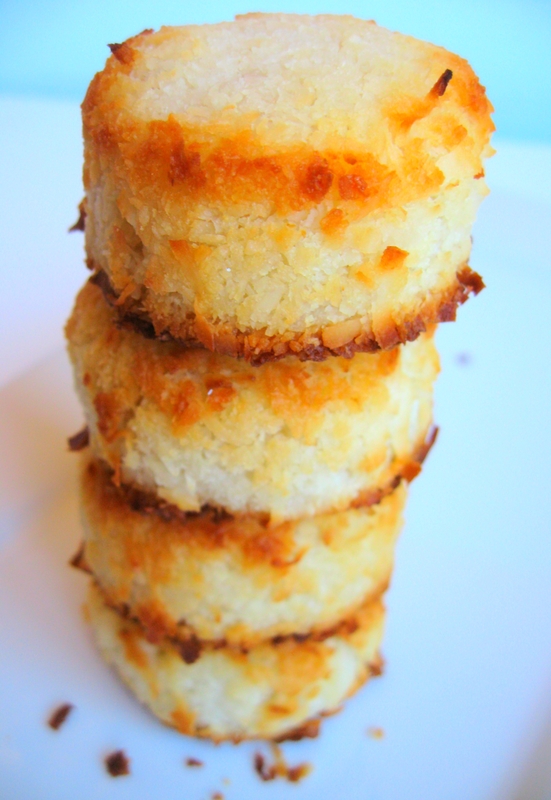 I feel like I am forever in search of the perfect coconut macaroon recipe, having tried desperately to replicate the Harris Ranch cookies over the years, to no avail. What I definitely do know is that they add both almond and vanilla extracts, and the coconut they use is ground into little pieces, and not long shreds, which I think makes the texture especially good. Now some people like to dip their macaroons in chocolate. And while I agree that it does make for a beautiful presentation, I find the addition of chocolate to be overwhelming. It is far too sweet, and in the end all it really does is mask all of the great coconut flavor that you have worked so hard to achieve. These last couple of years I have been successfully using the America’s Test Kitchen recipe for their triple coconut macaroons, with a few of my own little twists. The dessicated coconut that I buy is already in fine pieces, but I take the sweetened shredded coconut and grind it in the food processor until it, too, is in nice, small pieces. I then add a teaspoon of almond extract, which the recipe does not call for, and also as much pure coconut extract as I dare (usually about two teaspoons). I have made the recipe without these adjustments, and I have found that while they are perfectly delicious, they don’t really have that punch of coconut flavor that I am looking for (curse you Harris Ranch and your damn delicious cookies!!!). I prefer the hockey puck shape (which I achieve by using a medium-small ice cream scoop and flattening the mounds out with the palm of my hand) to the little pyramids (which I just don’t have the patience for). I typically also bake my cookies for a couple of extra minutes (about 19 rather than 15) because I like them to get as browned and toasted as possible, which forms a delicious crunchy exterior, enclosing a moist and chewy interior. And while these are not the Harris Ranch macaroons, they are certainly, by far, the best I have ever made myself. So for now, second best is as good as it gets. Enjoy! I just found your blog and love all your delicious looking baked goods. WOW! These macaroons are practically jumping of the screen and into mouth. 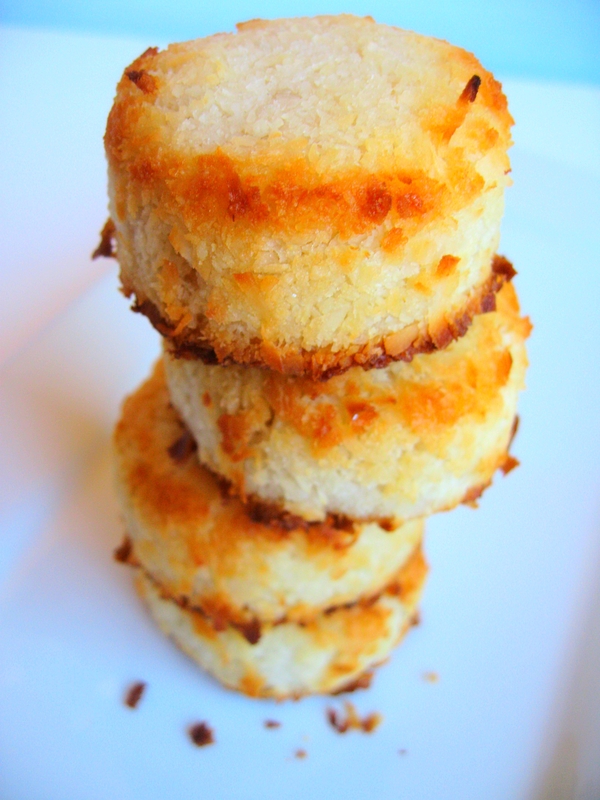 I LOVE macaroons but no one else in my family likes coconut–Crazy I know. I just was at Harris Ranch last month and now I am so sad I did not try their macaroons. I have a new baking blog if you want to take a peek. 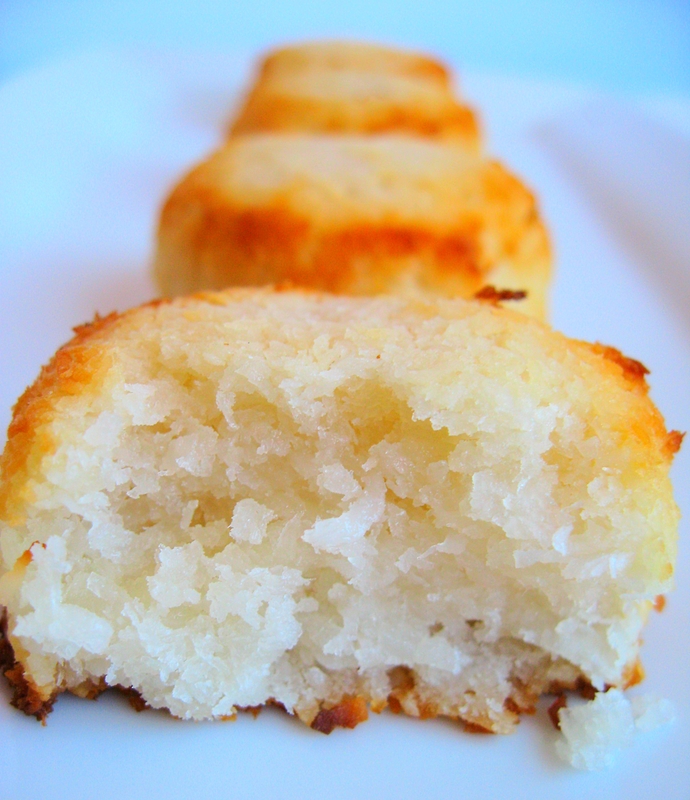 I’ve been seeing a lot of recipes for French macaroons recently and while they look delicious, I adore coconut macaroons. If I see them at a bakery, I have to try one. Yet I have never made them myself… but after seeing this post, I may have to try. Yeah, they are delicious. And also surprisingly simple to make. You should give them a try! The French macaroons ARE beautiful, but I find that they often taste like nothing. (I mean, is it just me?!) 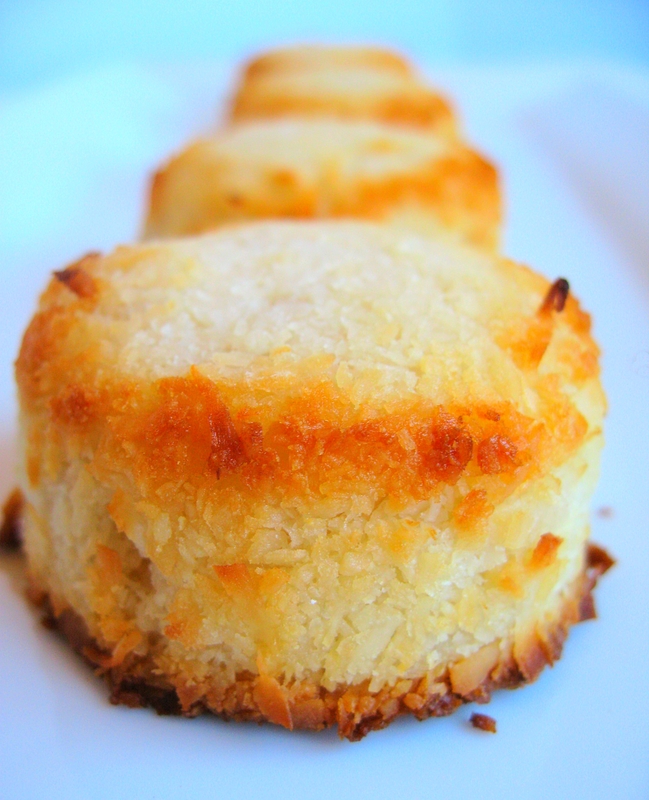 But you can hardly ever go wrong with a coconut macaroon! I agree… I always cook mine a little longer as I like the toasted top as well. I take a few out early for my husband and toast up the rest. I love the ease of a few ingredients and a big powerful punch of flavor. Nicely done! I love coconut too. 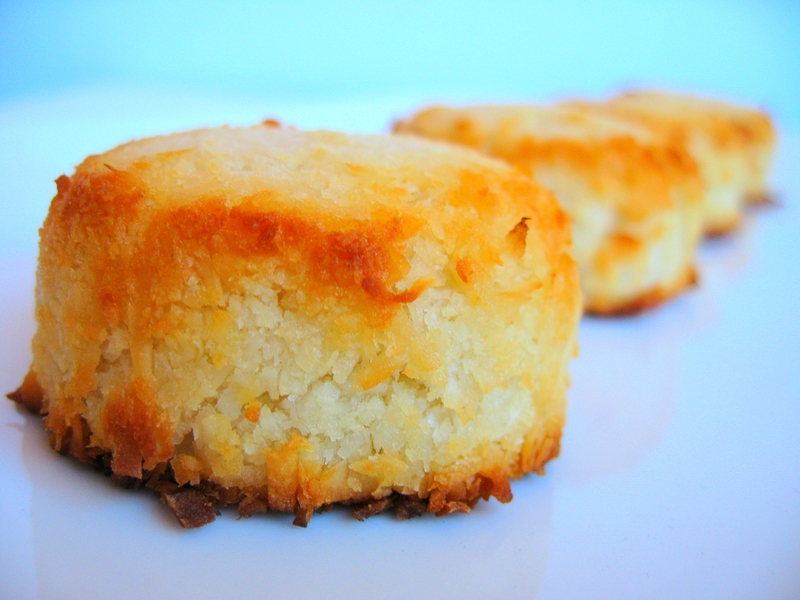 Coconut macaroons are one of my favorites–I really love them dipped in chocolate! These look great. The last picture with the bites out of the macaroon makes me salivate! These look great. I am a huge fan of coconut as well! These macaroons sound and look fantastic, great photos! Oh yum!!! I adore a good macaroon! I think I am drooling.. I love a good Macaroon, looks very delicious. Ooo… these look pretty addictive. Hmm…mm… yummm… Thanks for sharing & enjoy your day. Next time I at Harris Ranch, I MUST try those macaroons you described. I love the shape that you did yours in and I do love the tip to use the dessicated coconut. I can just imagine these dipped half way in chocolate. Nice job! I can consume an incredible number of coconut macaroons! I’m mean it’s really scary! Love Love Love them. I’m afraid if I actually make them – I will eat so many that they will make me ill. These look AWESOME! My mouth is watering just looking at the photos. I’ll have to agree with Marisa Musto here… coconut is only improved with a bit of chocolate! These look awesome! I totally agree about the chocolate – it can overwhelm the coconut flavor. I love the shape of your macaroons, mine alwaus turn out flat and lumpy and weird! These look so good! I love coconut too! Light, pillowy macaroons. Okay. Your gorgeous photographs have given me a serious craving. I love coconut and macaroons. These look really good, the ones I’ve tried making before came out too dry. Coconut is one of the controversial ingredients, but I am on the side that loves it! They look beautiful. Yeah, I guess you are right. It’s like cilantro. Some people just don’t like it. But that’s fine. More for me!!! These look absolutely heavenly. You are right…coconut ANYTHING is great! Beautiful texture too. OMG – these look perfect! Have you ever tried making them with agave nectar? I think it would work – and it’s a healthier sweetener. Maybe even up the quantity a bit and you could take out the sweetened coconut, too. Just sayin’ ! My husband is originally from India and is crazy about Coconut Macaroons and pretty much anything with coconut because it’s one of those tastes from his childhood. These macaroons look so unbelievably good I’m inspired to go above and beyond and create some amazing food gifts for friends and family this holiday season. To get that extra punch, try using young coconut and grating it yourself. It is a much softer coconutand has more of the flavor-as coconuts age, they turn brown and the flavor slowly leeches out of them. By using young coconut (found in the freezer aisle of most grocery stores-central market, sprouts, etc) you will obtain more coconut flavor and a softer more moist cookie. I was just there at Harris Ranch and agree those are the best macaroons I have ever had! I had both, with and without chocolate. I was looking for a Harris Ranch copycat, and I will give your recipe a try. Thank you! Stopped by Harris Ranch yesterday. The macaroons were great. I have tried several times to make these, only to have the coconut milk leak out during baking. Must be how I am folding in the egg whites. Looking forward to trying this new receipe.